There's been some discussion recently at the office about Radon Gas. It's invisible and ordourless and occurs from decaying uranium beneath the earth's surface. It then rises through the soil and seeps through cracks, holes and drain pipes in the basement. 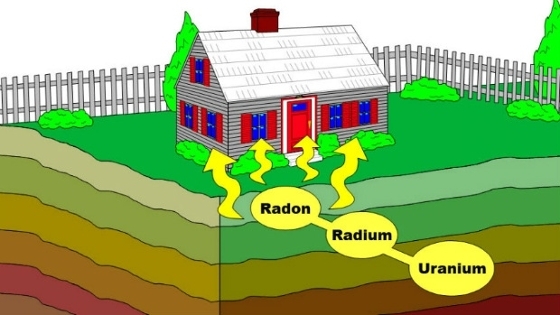 Radon gas contains radioactive particles that get trapped in your lungs everytime you breath. As the gas particles break down, they release small bursts of radiation that can damage lung tissue, and eventually cause lung cancer. In 2012 Health Canada released a report showing that 6.9 % of Canadians are living in homes with radon levels above the current Canadian guidelines. Despite existing test results in your neighbourhood, radon levels can vary from house to house, so Health Canada recommends that all Canadians test their homes. It's easy to remedy however with proper ventilation in the basement. So no need to panic! I've just bought a test kit today, and it's set up in the basement. After 3 months, I will send it out to a lab to be tested. Once I've got the results, I'll blog again with the details. I've been curious to learn more about this as it isn't talked about too much in Toronto, but I think it's better to be safe than sorry! If anyone wants more information about where to get a test kit for your home or how it works, just let me know. And a year later... I did the test and the results were way under what the acceptable levls are at. Well worth the small costs to purchase the test ket, and easy to do and submit. It really could be a life saver!